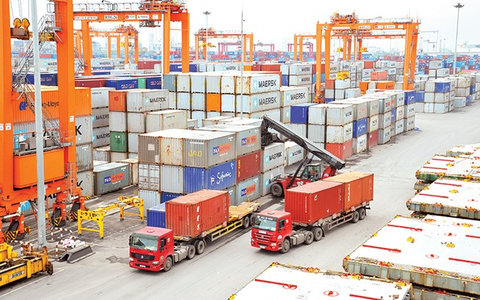 Hanoi (VNS/VNA) - Vietnam’s total trade turnover reached 100 billion USD between the start of the year and March 19, according to the General Department of Vietnam Customs. Recently released statistics show the country had a trade turnover of 21.3 billion USD during the first half of March, up 18.6 percent against the second half of February. This result helped to bring the country’s total trade turnover to 93.6 billion USD by March 15, edging up to 100 billion USD by March 19 – a surge of 6.3 percent on year. The total value of exported goods was 10.95 billion during the first half of March, an increase of 13.6 percent compared to the second half of February. A number of export products recorded strong rises in value during the March 1-15 period compared to the second half of February, including telephones and components (up 15.7 percent), garments and textiles (27.2 percent), computers, electronic items and components (17.3 percent), wood and wooden products (39.2 percent) and means of transport and spare parts (27.4 percent). These figures lifted the country’s total turnover of exports to 47.05 billion USD by March 15, up 5.4 percent compared to the same period in 2018. In the first half of March, Vietnam imported 10.34 billion USD worth of goods, up 24.5 percent against the second half of February. By March 15, the total import value for the year reached 46.55 billion USD, a year-on-year increase of 7.3 percent. Export value of foreign direct investment (FDI) enterprises from March 1 to 15 reached 7.82 billion USD, up 12.7 percent against the second half of February. By March 15, the total export value of FDI enterprises reached 32.76 billion USD, an increase of 2.7 percent over the same period in 2018, accounting for 69.6 percent of the country’s total export value. Import value of FDI enterprises in the first period of March 2019 reached 6.02 billion USD, an increase of 22.1 percent compared to the last 15 days of February. As of March 15, 2019, the total value of imports of FDI enterprises reached 27.22 billion USD, up 4.7 percent, accounting for 58.5 percent of the country’s total import value.